Across hill and dale, on wet and sandy terrain or through small streams and puddles - trail running describes the running sport that takes place off the asphalt. One naturally needs the right shoes for that! 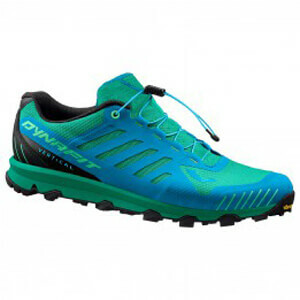 Depending on how hard the chosen route is, the trail running shoes should satisfy certain prerequisites. An import selection criterion for trail running shoes is weight. The rule is: the lower, the better -after all, you don't want heavy bricks on your feet, but instead zip gracefully over the countryside. The soles of trail running shoes come in very different profiles. However, good grip and a non-slip sole are always advantageous. Everything else depends on your personal requirements for the shoes. Some prefer models that allow them to feel the ground through the soles. Others put greater store by more comfort and padding. Trail running shoes with a waterproof surface are suitable for everyone, who goes outdoors even in wet conditions. The feet remain nicely dry with the help of a windproof and waterproof membrane. The important thing is that moisture is conducted outwards from the feet. This ensures a good foot climate! Trail running shoes also require good stability. The shaft in many models is strengthened to ensure that you don't twist your ankle even on boulders and rough terrain. A low center of gravity also positively influences stability. Special sole constructions make the heel-to-toe movement easier, improve the cushioning and flexibility of trail running shoes. In addition to that, a robust, durable upper material is advantageous. When you brush against twigs, run over sharp stones, or the sun's intensity is too high, how long the material can withstand the enormous stress becomes evident. Trail running shoes should protect the runner from the terrain, so that sharp edges have no chance to penetrate the sole. A certain rigidity and cushioning is also necessary, it however depends on the runner's preferences. Some prefer a natural gait with intensive ground contact and a flexible sole. Others prefer trail running shoes that go easy on ligaments and joints and put great store by pronounced cushioning and a soft footbed. Simple lacing makes putting it on and taking it off easier and provides good grip in the shoe. Our customer service will gladly provide information on the different trail running shoes and find the suitable model for each purpose.